So, I live in Austria, right? That means there are a lot of pumpkin seeds in my diet. I put them in my granola. I sprinkle them on salad. And I put them in bread, of course! So, when I went to create a new wholesome bread recipe, there was no doubt what would make this bread stand out. Pumpkin seeds! This recipe has a nutty and crunchy crust, while the dough or "crumb" is chewy and slightly sweet. It stays nice and firm after cooling, making it a wonderful sandwich bread. Using your electric mixer with a paddle attachment or your bread machine, combine the ingredients – keeping in mind your machine’s instructions. Once the dough has doubled, pour it out into a floured surface, give it a good kneading - a couple minutes - and then place it greased bowl. Leave it to rise once more. Now preheat your oven to 200 C (or approximately 390 F). Once the dough has doubled again, pour it out onto the pumpkin seeds. Gently roll it over the mixture. The seeds stick to the dough and create a lovely pattern. Place the dough on to a baking sheet, and cover with a damp towel. Let it rise another 15 to 20 minutes. Once the dough has risen about 50 percent more, place it in the oven. Baking time will be between 30 and 35 minutes. 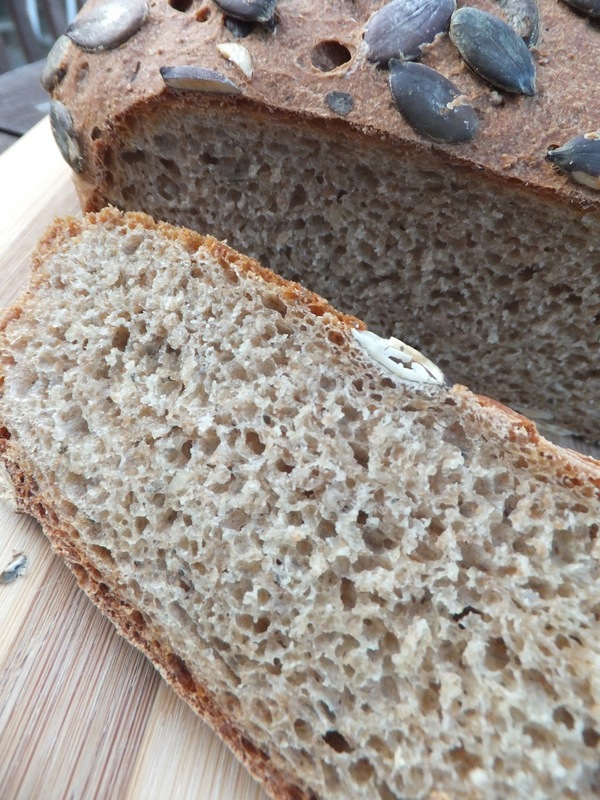 The bread is ready when it turns a lovely dark brown and the seeds are nicely toasted. I hope you are enjoying the autumn season. Bake on! Fall is here. I can feel it in the cool air, I can smell it in the trees. The days grow short, and the quality of light changes. That means it's time to bake again! My oven has been lonely; my ceramic pie dish has languished on the shelf all summer. How about a pie? I am trying to eat more "whole" foods, so I decided to look to past experts on healthy eating. I scanned my kitchen shelf and stopped at Mollie Katzen's The Enchanted Broccoli Forest. Molly wrote this popular cookbook back in 1982. I am pretty sure I bought my copy that year or shorty thereafter. 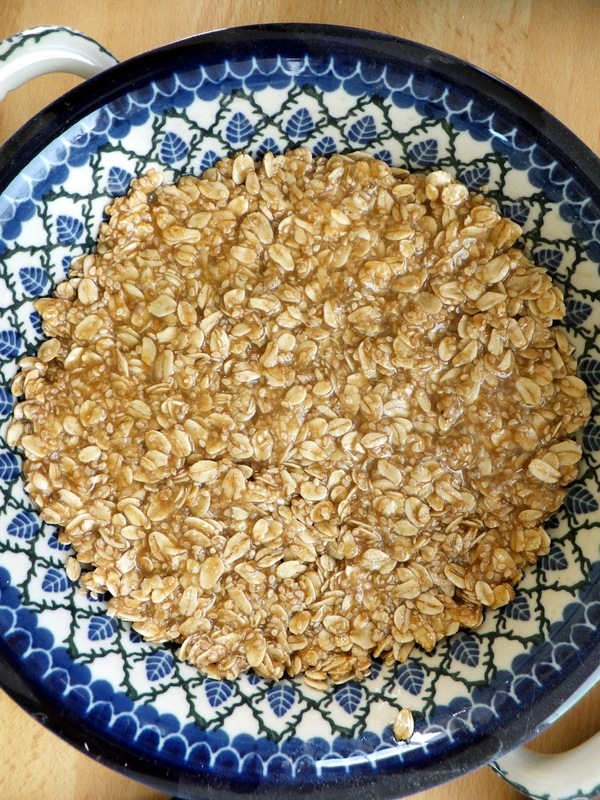 As I browsed the book, I found a delicious-sounding crust recipe there, Oatmeal Cookie Crust. It has oatmeal, whole wheat flour, chopped nuts, and sesame seeds. Sounds great! Thankfully, Mollie has the recipe available online. In terms of filling, I knew just what to but in - nectarines. This is a wonderful fruit for pie; it's tart and sweet at the same time. And it has lovely shades of orange, yellow, red and burgundy. Beautiful! Make the Oatmeal Cookie Crust dough. Press 1/2 of the dough into the bottom of your pie shell. Reserve the rest for a crumble topping. Spoon the filling onto the dough layer, then top with the remaining dough. Bake at 365 F or 185 C for approximately 35 minutes. This pie smells absolutely delicious as it completes its baking cycle. The dough is a lovely combination of chewy and crunchy. 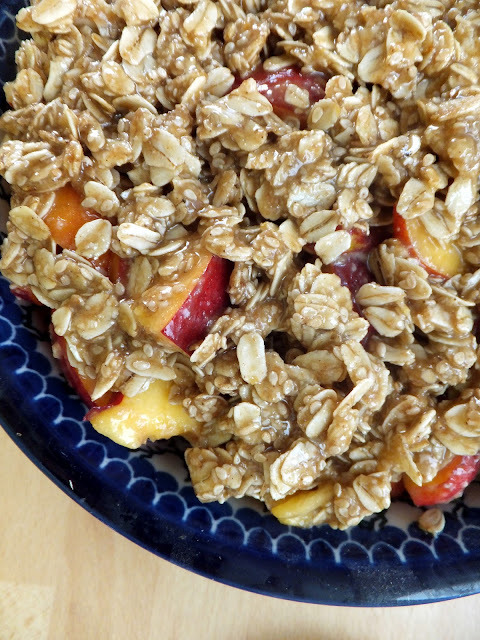 The pairing of nutty and fruity is perfect! I am happy to say the Mollie's Enchanted Broccoli Forest is still available for purchase at IndieBound. Happy Baking and Happy Fall! Shared with Everyday Mom's Meals, Pamela's Heavenly Treats and Petite Hermine. I am busy back at the sewing machine after weeks of travel and house guests. I am especially proud of a new Vienna Market Basket I just finished and listed in my Etsy shop. These baskets require over 100 feet of rope, which I hand wrap with new and upcycled fabrics. It can take a couple of days just to complete the wrapping process! I use a zigzag stitch to sew the wrapped rope into the large basket form. It takes over 500 yards of thread just to make the basket body! If you haven't purchased thread in awhile, you may be surprised that is quite pricey, especially here in Austria. So, imagine how happy I was to find a perfect tool to support my thread habit - the Superior Heavy-Duty Thread Stand. It was a bargain at $15.99. 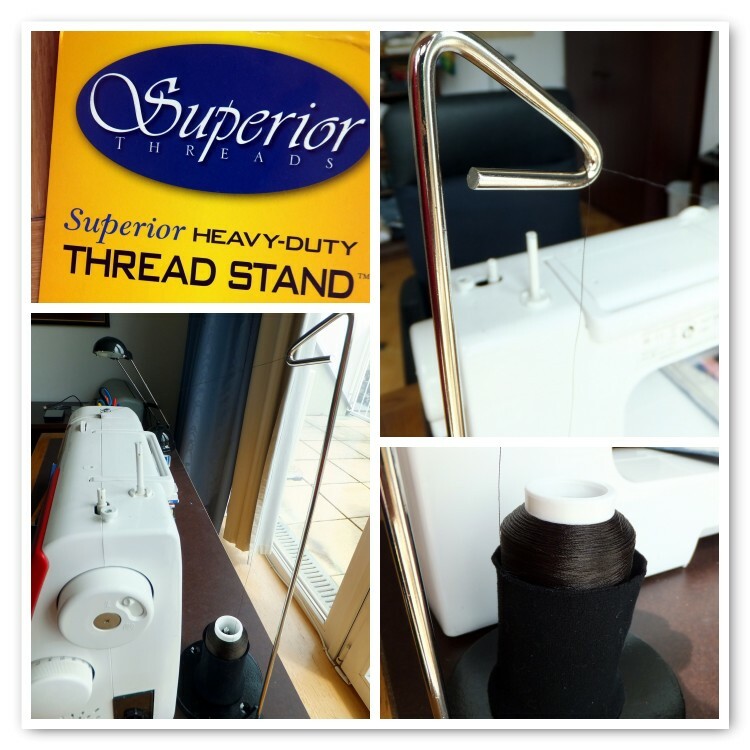 This metal thread stand holds large thread cones made for Serger sewing machines. It works like a charm on my little Toyota machine. Now I spend less money on thread (by buying the larger cones) and less time changing spools. Yay! Now if they could only invent an attachment for a super-sized bobbin! Say hello to Ms. Kitty! This summer I happily made a project for our first grandchild. I swear I cannot be that old! 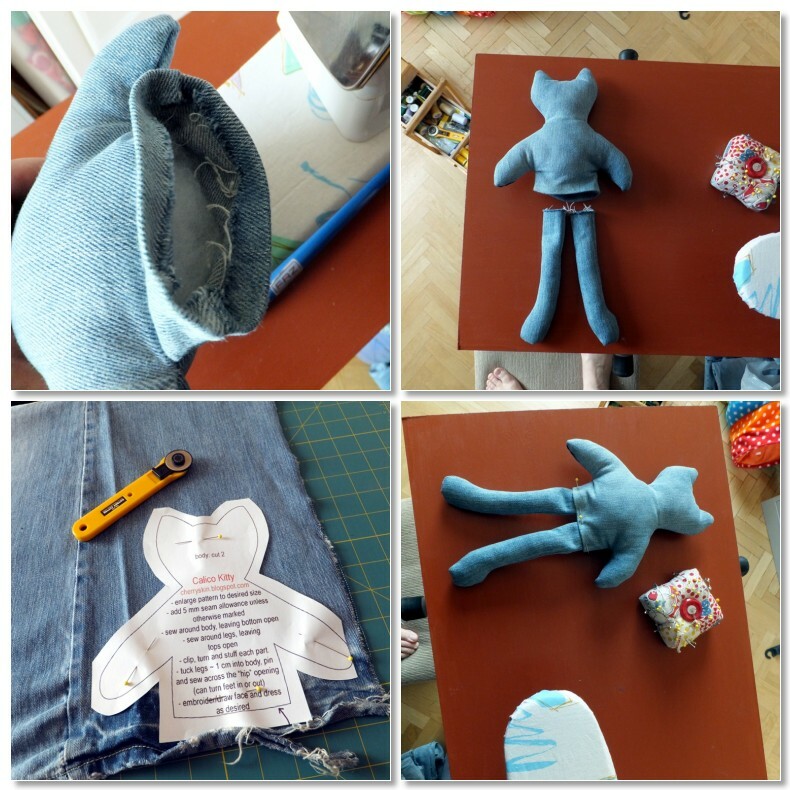 I love using a mixture of new and recycled materials, so I looked around for a nicely worn clean pair of jeans and went to work on Project Ms. Kitty. I found Ms. Kitty's pattern from a blog called Cherryskin. It's simple and easy to follow. 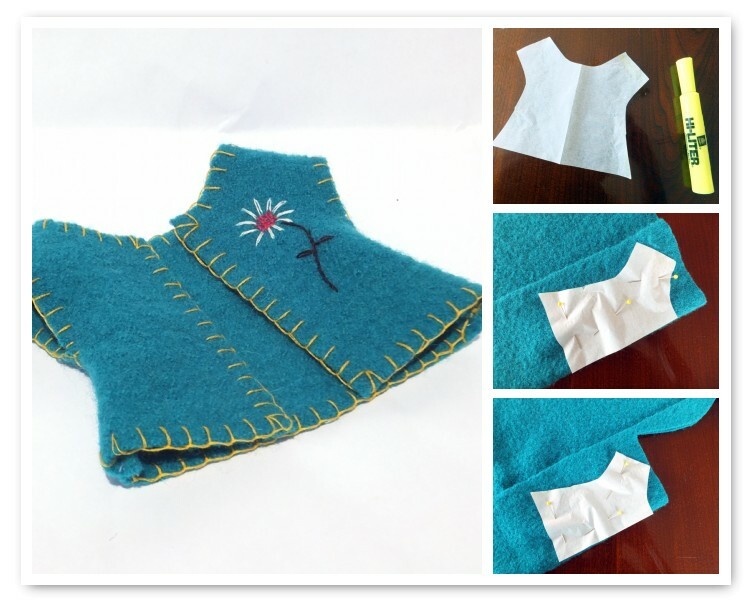 Using the free pattern, just cut out your pieces, sew them and stuff as instructed. After you have sewn all parts together, draw and embroider Ms. Kitty's face. Add any other embroidery details you may like. I added pink ears and a colorful tummy fish. Once your Ms. Kitty is finished, you might want to give her some clothes. I decided on a nice Austrian boiled wool jacket and a cute little skirt. After all, Ms. Kitty is from Austria! I made the jacket by tracing Ms. Kitty's outline on a piece of paper. Then I used the paper pattern to cut out the boiled wool. I sewed back and front together and embroidered edges and front. I sewed a little elastic waist skirt to finish the outfit. Give the pattern a try and let me know your results. Okay, now it's time to get back to my shop! Interested in tutorials? Click here. Shared with Made By You Monday @ Skip To My Lou and Sunday Linky Party @ Petite Hermine.